RKI’s new SDM-2009 calibration station for the GX-2009 is now available with advanced features for charging, calibration, & bump testing. Once you power up the GX-2009 inside the SDM-2009 calibration module, the GX-2009’s display will indicate whether it’s transmitting data, bump testing, calibrating, as well as the results of the bump test or calibration. The SDM-2009 can also be connected to a PC for automated calibration, bump testing, and archiving of logged data including calibration and bump test records, interval and alarm trends. 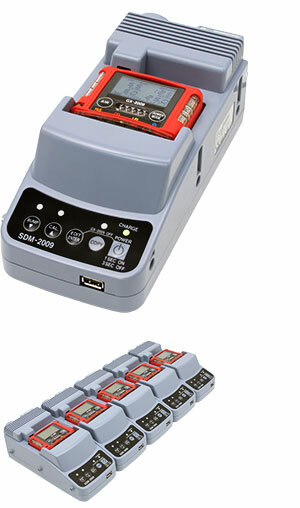 Network up to 10 SDM-2009 stations to charge, calibrate, and bump test 10 instruments simultaneously. Each SDM-2009 ships with a pictorial wall chart user guide. This guide gives the already easy to use cal station a simple pictorial easy step by step guide to calibrating or bump testing a GX-2009. It’s ideal to hang in an instrument shop or wherever the GX-2009 is located.